Ernst Curtius (September 2, 1814 – July 11, 1896), was a German archaeologist and historian, best remembered for his excavation of Olympia, the most sacred place of ancient Greece. Curtius was a serious scholar and scientist, who approached his archaeological work in an academic way, seeking knowledge that would benefit all. He uncovered the site of the original Olympic Games, including the stadium which was restored for use when the games were held in Athens in 2004. The results of his work include some of the most beautiful pieces of artwork preserved from ancient times, all of which remained in Greece as he had promised. In this way, Curtius' work has provided a gift of beauty from the past to be enjoyed by all humankind. Ernst Curtius was born on September 2, 1814, in the city of Lübeck, Germany. His father was the mayor of the city, and the important figure in local politics. His younger brother Georg Curtius was a famous philologist. Ernst Curtius studied under Friedrich Welcker in Bonn, Karl Otfried Müller in Göttingen, and August Boeckh in Berlin. Upon completing his university studies he was chosen by classicist Christian August Brandis to accompany him on a journey to Greece, as a tutor for his children. It was on this journey that Curtius became interested in Greek mythology and culture. Curtius then joined Müller as his companion in the exploration of the Peloponnesus peninsula. After Müller's death in 1840 he returned to Germany. In 1844, he became a professor at the University of Berlin, and in the same year was appointed tutor to Prince Friedrich William (later Kaiser Friedrich III), a post which he held until 1850. It is said that the Kaiser's interest in science was largely influenced by his tutor, Ernst Curtius. In this period, from 1857 to 1861 he wrote and published his seminal work: Griechische Geschichte in three tomes (The History of Greece in five volumes, published in English from 1868–73). This was the first study of Greek history published in the German language, and was presented in an attractive style based on the latest scholarly research of the time. Soon after being released it became rather popular. After holding a professorship at the University of Göttingen and undertaking a further journey to Greece in 1862, Curtius was appointed full-time professor of classical archaeology at Berlin in 1867. At the same time, Curtius served as a director of the Altes Museum and Antiquarium, opening the branch of the German Archeological Institute in Athens, Greece. He successfully lobbied the government to begin excavations there. After Germany finally received the exclusive rights to conduct excavations at Olympia, Curtius was sent by the German government in 1874 to Athens. He spent six years, from 1875 to 1881, leading large-scale expeditions of archeologists who performed excavations in Olympia. Among other famous discoveries, they found the Temple of Zeus and Praxiteles' sculpture of Hermes, which is among the most prized sculptures preserved from antiquity. Curtius continued his excavations until his death in Berlin, in 1896. The person who influenced Curtius the most, and whose impact can be seen in his work, was Curtius’ professor in Göttingen, Karl Otfried Müller. It was Müller who introduced Curtius to excavations, and who invited Curtius to join his excavation team in Peloponnesus and later Delphi. After Müller’s death in Athens, Curtius continued working on the excavations. 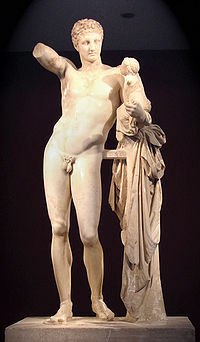 Hermes bearing the infant Dionysus, by Praxiteles. Curtius was extremely systematic in his work. In the period from 1875 to 1881, almost the whole of Olympia was unearthed, revealing some of the most beautiful artistic pieces of Ancient Greece. Besides numerous coins and inscriptions, Curtius also found the well-preserved statue of Hermes carrying the infant Dionysus by Praxiteles. Curtius also found the temple of Hera, the altar of Zeus, the former site of the enormous statue of Zeus (one of the Seven Wonders of the World), and the original location of the Olympic stadium, where the Olympic Games took place in Ancient Greece. There was one significant difference that separated Curtius from other excavators. Archaeology in the mid-nineteenth century was still a young discipline, and most archaeologists were amateurs, driven by either their passion for antiques or by the desire for a treasure-hunt. Curtius, however, was one of the first who approached archaeology from a strictly academic perspective. Even before the excavations in Olympia started, Curtius agreed that all the artifacts found by his team would remain in Greece, and that nothing would be taken away; an agreement which he kept. After Curtius, this practice in archaeology continued, archaeology becoming a more professional science. Curtius led one of the first archaeological expeditions to Olympia in Greece, where he made a number of significant discoveries that contributed toward better understanding of the Ancient Greek civilization. He was also one of the first archaeologists who was not motivated by treasure-hunting, but by true scientific inquiry. Following his work, German archaeology became more professional and academic. Curtius was succeeded by Ulrich von Wilamowitz-Moellendorff (1848-1931) at Berlin, who continued his work. Curtius' younger brother Georg Curtius (1820-1885) was an eminent philologist, and his grandson the literary historian Ernst Robert Curtius (1886-1956). Curtius, Ernst. 1844. Die Akropolis von Athen. Curtius, Ernst. 1855. Die lonier vor der Ionischen Wanderung. Curtius, Ernst. 1865 (original 1862). Attische Studien. Curtius, Ernst. 1877. Die Ausgrabungen zu Olympia. Curtius, Ernst & F. Adler. (Eds.) 1882. Olympia und Umgegend. Curtius, Ernst & F. Adler. 1898 (original 1890). Olympia: Die Ergebnisse der von dem deutschen Reich veranstalteten Ausgrabung. Curtius, Ernst. 1891. Die Stadtgeschichte von Athen. Curtius, Ernst. 1894. Gesammelte Abhandlungen. An Olympic Excavation - Description of Curtius' excavations at Olympia. Curtius Ernst – Short biography in Online Encyclopedia. This page was last modified on 16 August 2017, at 15:19.